Summary: Theresa May has given a Leader’s speech that has left her more fragile and at risk than ever. The money she promised to put into housing is far too little to make any significant difference. We need to deal with this on a much larger scale. Only by borrowing to invest in our housing stock can we start to deal effectively with the enormous backlog of nearly 2 million people on the social housing waiting register in England alone. We don’t have the manpower to do this in theory. The key is to invest in large-scale modular building factories that can produce houses with much less manpower than currently needed to build a house. It takes a lot for me to feel sorry for Theresa May. Her Leader’s speech today at the Tory party conference was an unmitigated disaster. She came in to the whole to a seriously out of date pop song, kept talking while the letter “F” fell off the screen behind her (jokes of F-off will surely be along soon), a prankster delivered a P45 apparently signed by Boris Johnson and she began to cough almost uncontrollably. At first sight one of the most trailed offers to the young and the poor was £2 billion for the housing market to enable more affordable houses to be built. 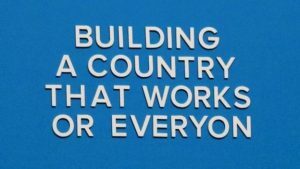 This was in addition to the £7 billion already allocated, and a further £10 billion in loans for the Help to Buy scheme. For the first time in a generation councils will be encouraged to get back into the business of building houses, at least some of them for social rent (well below market level). It will be easier to get planning permission yet that is not currently a problem. There is already planning permission granted for about 600,000 houses. A further 320,000 planning applications were approved last year as well. A reasonable number of these are for multiple units of accommodation. Despite the protestations of the building industry there is no shortage of approved sites for new homes. The total available for building affordable houses of £7 billion might, with a bit of luck, pay for 35,000 homes over several years (we don’t know over how many in fact but it won’t be in one year for sure). Most agree we need to build around 250,000 new homes a year simply to keep up with demand, and more if we are to begin to catch up on the dreadful backlog that has accumulated by years of neglect from a Tory government. In the year to June 2016 only 139,000 new homes were completed. Most of these were built by private developers and a negligible fraction were “affordable”. In the 1970s there were years in which over 350,000 houses were completed, nearly half of them built by local councils. We must borrow much larger sums of money to have any hope of achieving such a target. We don’t need to borrow the money for all these houses because as soon as some are built they may be sold privately at market value while others are retained by local authorities to rent at affordable and social levels. The other challenge is physically building that number of houses. You can read more about this here: http://outsidethebubble.net/2017/06/22/solving-the-housing-crisis-a-fairer-deal-for-all/. Current statistics show it takes about 6.6 construction workers one year to build one house. If we rely on conventional construction methods we can simply forget building at the rates we need. We simply don’t have the people in the job market today to do it and, should Brexit substantially reduce inward migration of skilled craftsmen this will be even more acute. What we must look at much more seriously is the use of modular homes. They will be somewhat cheaper than conventional build homes but most importantly they require much less manpower to build and install on-site. The name “prefabricated homes” tends to send a chill through many older people who remember the prefabs built to provide urgent accommodation for a nation laid low by many years of war. Modern modular homes are built to an extremely high standard, indeed much better than many homes built today in Britain. Some of the more successful companies are Scandinavian and German where winters are colder and summers are hotter than in the UK. Their installation and standards of construction are extraordinarily high and they really do have the potential to revolutionise the British housing industry. The UK would need to license the technology from those companies and have their help in establishing major fabrication facilities in the UK to meet demand. This would allow a major house building programme without as big an increase in the people needed to deliver for the dreams of so many of the 1.8 million people waiting today on the social housing register in England.